Ari Goldwag talks about how he shaved his beard for a special video promoting unity and tolerance between all Israelis. 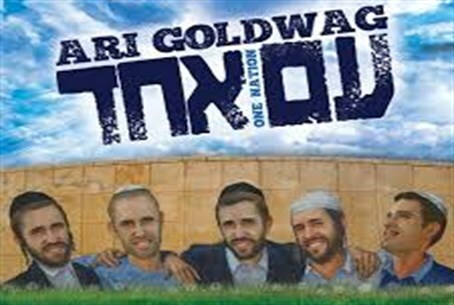 Ari Goldwag, a singer/songwriter based Beit Shemesh has called for Jewish unity amid political tensions in a new video. Am Echad - One Nation has garnered over 220,000 views on YouTube. It depicts five characters from across the religious spectrum, all performed by Goldwag. Goldwag spoke about it in a special in-studio performance on Arutz Sheva's Israel Beat Jewish Music Podcast. For full audio interview click here. "Yes, I really shaved my beard," Goldwag smiled, referring to the typical clean-shaven secular Israeli he portrays in the video. As for the hassidic Israeli he explained, "I didn't really grow long peyos (sidelocks) or a beard. I had a professional make-up artist from Tel Aviv. You can actually rent a beard if you ever need do go hasidish." He added, "it was all to give the message that it doesn't matter what you look like, we can dance together." The video also has footage from Beit Shemesh showing residents of different walks of life enjoying the music. "The real-life audience were all different stripes and types of Jews. We really can dance together," Goldwag said. The tension in Beit Shemesh has reached a high with Tuesday's re-election for the contested mayoral race. Goldwag said the response to the video has been positive. "It breaks my heart what's going on here with all of the negative vibes, but to see a video that brings everyone together, it shows that it can be real." To download the entire interview in mp3 format click here. Ben Bresky is a music journalist living in Jerusalem. He hosts The Israel Beat Jewish Music Podcast interviewing a wide range of Jewish and Israeli musicians from Carlebach to klezmer, from hassidic to trance. For mp3 archives click here. For Facebook click here. For Twitter click here.